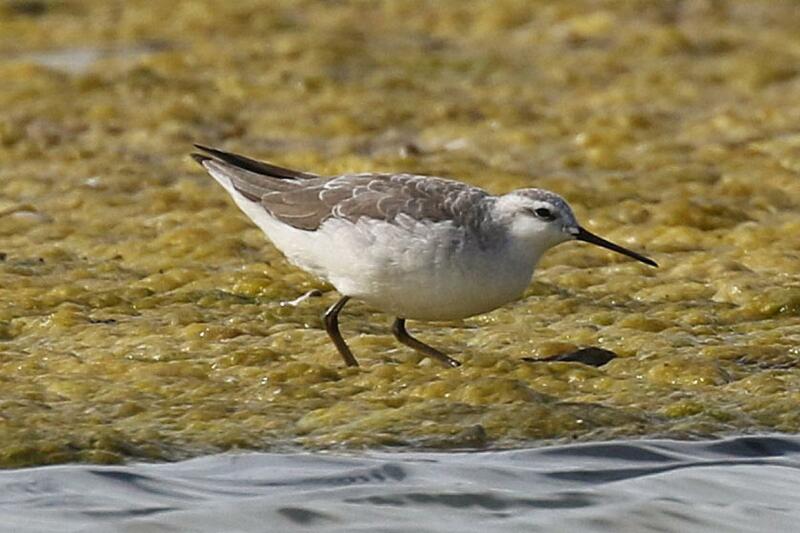 The three phalarope species are anomalous sandpipers that breed at mid- to high latitudes in the northern hemisphere, and migrate to the southern hemisphere. They are unusual for their reversed sexual dimorphism and aberrant breeding systems (females are more colourful, and may leave two or more males to care for consecutive clutches), and in being highly aquatic. Female phalaropes compete for nesting territories, court males, and aggressively defend their nest and mate. Wilson's phalarope is the largest and most terrestrial of the phalaropes. Named after Scottish-American ornithologist Alexander Wilson, it is a tall wading bird that breeds on the open prairies of North America. It migrates to western and southern parts of inland South America to spend the non-breeding season. 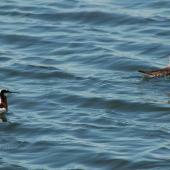 Unlike the other phalaropes it does not have fully lobed toes and spends little time at sea. 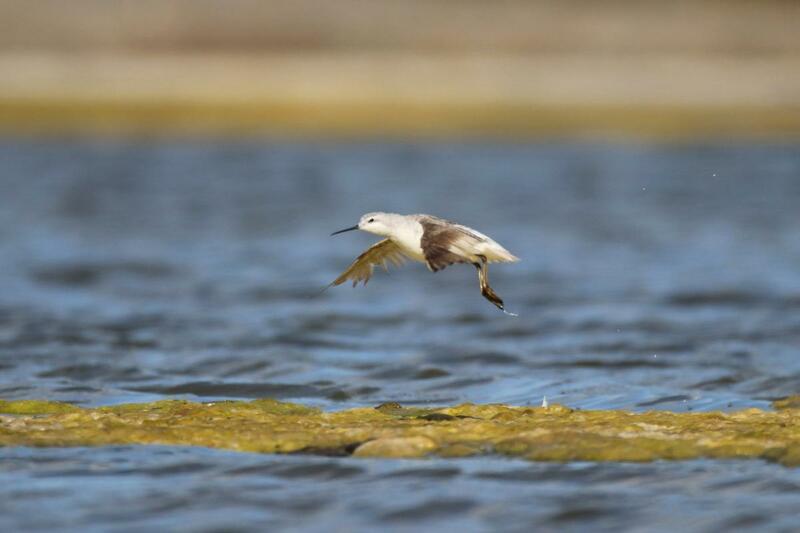 When feeding in water, it spins around more rapidly than other phalaropes. It rarely reaches New Zealand, where there are four records. 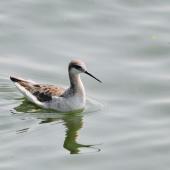 Wilson's phalarope is a subtly-patterned wader identifiable by its small head, long legs and black, needle-like bill. In breeding plumage, the female has a striking broad black stripe running from the base of the bill, through the eye and down the neck, and chestnut-reddish markings on the neck, breast and back. The crown and back are grey, the underparts are white, and the legs are black. Breeding males have a white crown and throat, pale chestnut nape and mantle, and pale grey-brown back. A fine black line runs from the base of the bill to behind the eye. In non-breeding plumage, both sexes look alike: pale grey above and white below with white face and eye stripe, and distinctive bright yellow legs. Juvenile resembles non-breeding male with yellow legs, but with distinctive dark brown-black mantle and back, and buff scaling or striping on back and upper wing feathers. Voice: flight call a soft, moaning wemf, vint or vimp. Similar species: grey and red-necked phalaropes are similar but smaller, and have black eye patches in non-breeding plumage. 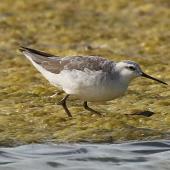 Wilson's phalarope has a longer, thinner bill than both, and its toes are not fully lobed. 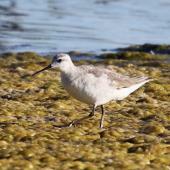 Lesser yellowlegs and stilt sandpiper have more elegant physiques (not pot-bellied) and heavier bills. 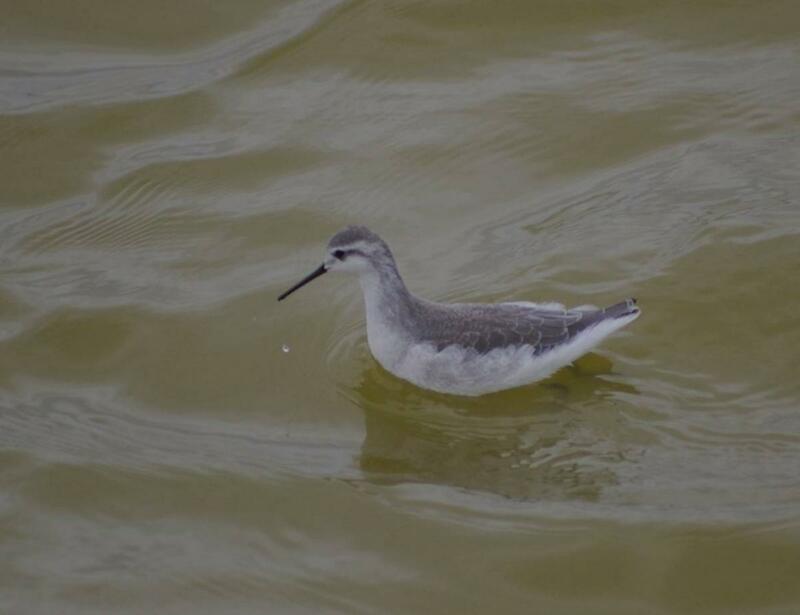 Wilson's phalaropes mainly inhabit shallow freshwater prairie wetlands in northern USA and southern Canada during the April-July breeding season. After breeding, adult birds migrate west to staging areas on large lakes in Oregon and California to moult. Birds then continue migration south through Central America, July-October. During migration, birds feed and rest by shallow ponds, flooded fields and coastal mudflats. In South America, birds inhabit inland wetlands including shallow freshwater ponds and saline lakes. Vagrant birds have been recorded from Hawaii, New Zealand, Australia and Antarctica. 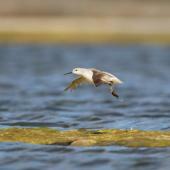 The total global population of Wilson's phalaropes is estimated to be 1,500,000 individuals. Wilson's phalaropes have been recorded in New Zealand on four occasions. 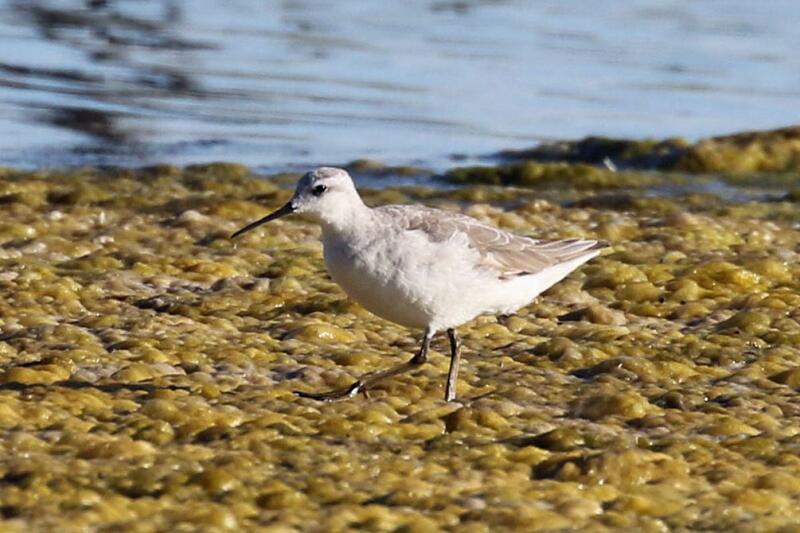 The first was at Manawatu estuary in September 1983, two birds were at Lake Ellesmere between November 1983 and April 1984 (with both together in December-January), one was at Taharoa, Waikato in October 2004, and one was at Ahuriri estuary, Napier, November 2016 to January 2017. The non-breeding season is August-March, and these five birds were mainly in non-breeding plumage. The very large global population appears to be increasing, hence IUCN Red List classifies it as Least Concern. Large areas of prairie breeding habitat have been destroyed through draining of marshes for farming. In response, breeding birds have moved westwards. 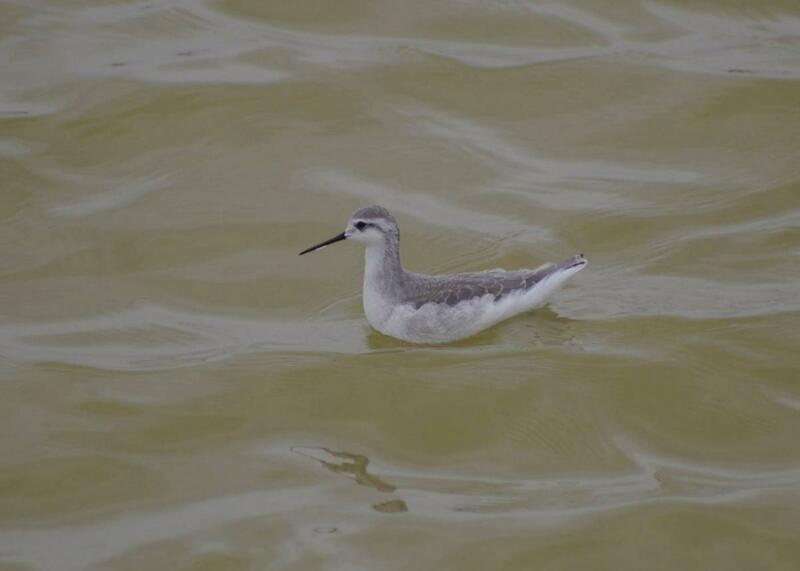 Wilsons's phalaropes congregate at a small number of main staging areas during migration which puts birds at risk, hence protection of these lake sites is a conservation priority. 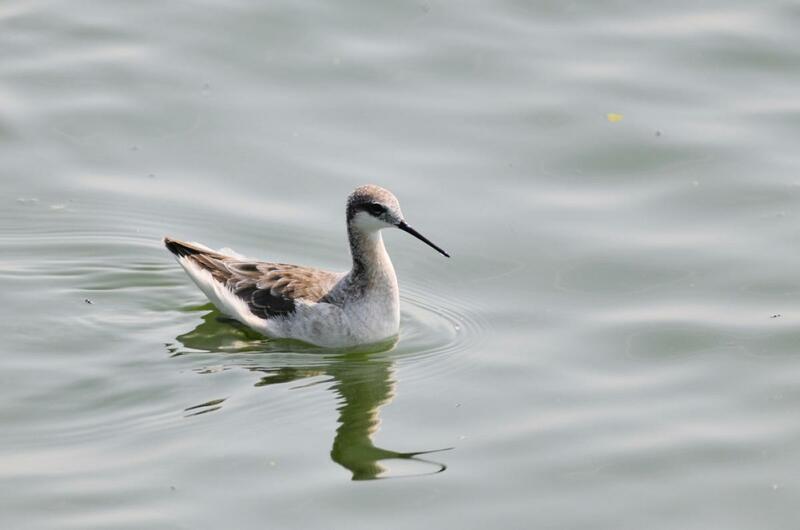 Wilson's phalaropes breed during April-July. Females arrive at prairie breeding grounds first, and compete for males as they arrive. Most pairs are monogamous, although some females mate with multiple males. Males build scrape nests lined with grass in vegetation near freshwater. Four pale buff eggs with brown spots are laid April-June; males incubates these for c.23 days, then briefly care for chicks alone. Young leave the nest within one day of hatching and then forage for their own food. Females leave the breeding grounds first; males follow once the young can fly. In contrast to the marine grey and red-necked phalaropes, Wilson's phalarope relies more on foraging in shallow water, or on shore. It regularly associates with American avocets and black-necked stilts, and is markedly more active than other shoreline-foraging waders. 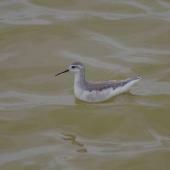 It breeds further south than other phalarope species. One bird observed in Antarctica in 1968 is the southern-most record of any wading bird. 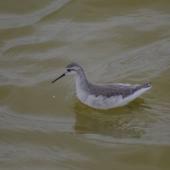 Wilson's phalaropes eat aquatic insects and small crustaceans, as well as brine shrimps and brine flies. Sibley, D. 2000. The North American bird guide. Pica Press, Sussex, UK. A tall, slender, subtly-patterned wader with a relatively small head, long legs and a long black needle-like bill. Adult birds in non-breeding plumage are pale grey above and white below with a white face, white eye stripes, and distinctly bright yellow legs.